I have a new piece of Froothie equipment to play with. It’s an Optimum HealthyFry – a rapid air fryer that can bake cakes too. Who’d have thought it? I have used it for frying of course, but I couldn’t wait to try baking a cake in it. With my promise to bring you all things vegan this month, I have created this rich and fudgy chocolate banana cashew cake. Ladies and Gentleman, forget the banoffee, I give you banashew. I knew the cake had to be a chocolate cake for We Should Cocoa, but what sort of chocolate cake? For some reason I had nut butter on my mind. I suddenly remembered the banana chocolate peanut butter cake I once made and what a good combination those three ingredients were. Then I thought of the cashew brownies that won a place in the Cranks recipe book and suddenly my vegan chocolate banana cashew cake was born. CT, being CT, promptly named it Banashew Cake. 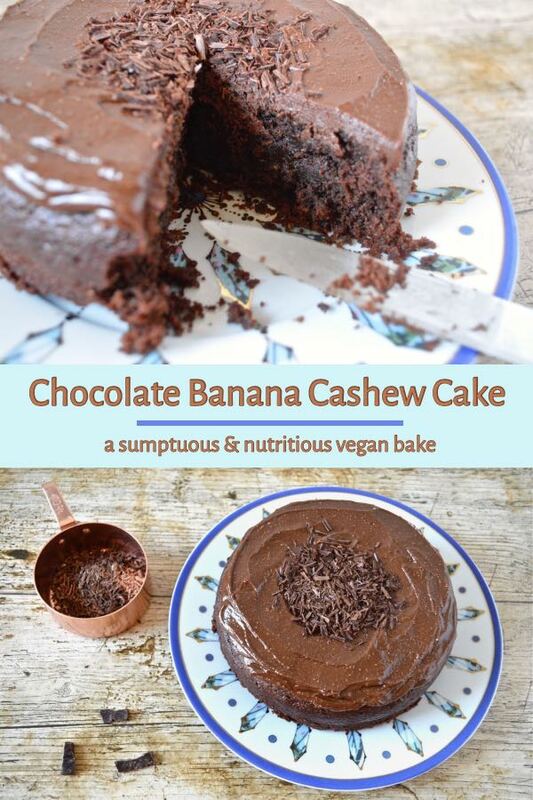 Like most of my cakes, this chocolate banana cashew cake is made with nutrient rich whole foods. This one is even more nutritious than normal, even though it’s iced. It contains healthy fats, wholemeal spelt and cashew nut butter. I’ve used rapadura as the sweetener. This is an unrefined form of sugar that retains many of the cane sugar’s nutrients. It’s particularly high in iron, which as a vegetarian, I’m always slightly concerned about. Vegan chocolate isn’t the easiest to find. Most dark chocolate is made in the same factories as milk chocolate and can be contaminated by dairy. Seed and Bean not only guarantee their dark chocolate to be vegan, but it’s organic as well. Vivani is not so easy to get hold of, but is also vegan and organic. The cake is a fairly modest one as the tin size that comes with the Optimum HealthyFry* is only 15cm / 6″ in diameter, but the quantities can easily be doubled for a more standard size. It’s quite a rich cake, so although it’s extremely delicious, a little goes a long way. It can, of course, be baked in a conventional oven. I have used the Optimum HealthyFry for purposes other than cake – honest! I’ll be writing a review and bringing you more recipes over the next month or so as part of #Jumpstart17. As a Froothie Ambassador, I can offer Tin and Thyme readers free P&P on any Froothie appliance* – add 2483 free ambassador delivery to the comment box when ordering to get free postage and packing. Delivery will be credited back onto your card. The Optimum HealthyFryer is currently on offer at £149. 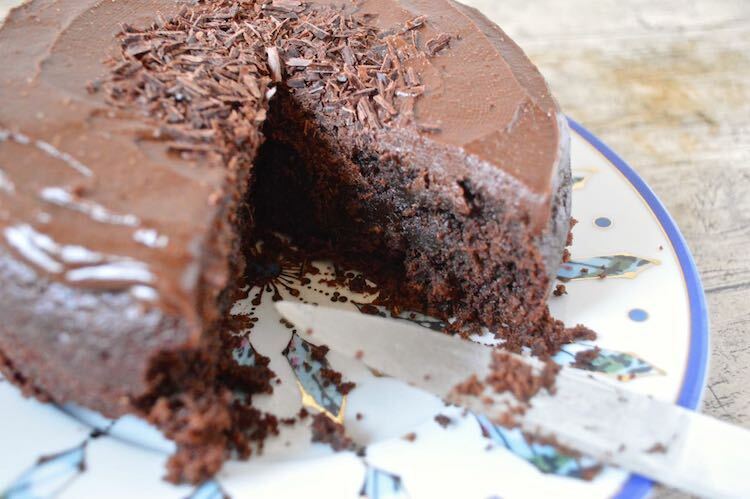 Rich and fudgy vegan chocolate cake. Nutrient rich and delicious. Made with wholemeal spelt, cashew nut butter and unrefined sugar. In a large pan melt the coconut oil over a low heat. Add the cashew nut butter, banana and rapadura and stir until the banana has more or less broken down and the mixture is almost smooth. Remove from the heat. Add the vanilla and cider and stir. Sift in the dry ingredients and gently stir, adding the water bit by bit as you go along. Line or oil the cake pan (or use a 15cm / 6" silicone mould or tin). Scrape the batter into the pan and cover with foil. Set the temperature to 170℃ and bake for 25 minutes. Remove the foil, set the timer for a further 10 minutes and bake until an inserted skewer comes out more or less clean. Alternatively bake in the middle of an oven following the same procedure as above. Remove the pan and allow to cool for ten minutes before turning out onto a wire rack to cool completely. Melt the coconut oil in a pan over very low heat. Add all the other ingredients, except for the chocolate and stir until smooth. Remove from the heat - add the chocolate and stir until combined. Spread over the top of the cake. Scatter with dark chocolate shavings if wished. The cake is quite rich, so a little goes a long way. Double the quantities for a 20cm / 8" cake tin. This vegan chocolate banana cashew cake, aka banashew, is my entry to this month’s #WeShouldCocoa. If you’ve made anything with chocolate this month, do join in. You have until 28th January. I’m also sending it off to #RecipeoftheWeek at A Mummy Too. Thanks for visiting Tin and Thyme. If you make this chocolate banana cashew cake, I’d love to hear about it in the comments below or via social media. Do share a photo on social media too and use the hashtag #tinandthyme, so I can spot it. For more delicious and nutritious recipes, follow me on Twitter, Facebook, Instagram or Pinterest. Chocolate Banana Cashew Cake. PIN IT. This post contains affiliate links to Froothie Optimum products. Links are marked with an *. Buying through a link will not cost you any more, but I will get a small commission. Thanks to my readers for supporting the brands and organisations that help to keep Tin and Thyme blythe and blogging. Love the idea of a banashew cake!! Sounds yummy. I used to have an air fryer and really loved it, but this one seems so versatile since you can bake in it too! It’s not what I was expecting when I signed up to an air fryer. It’s great to have such versatility! 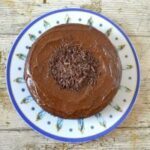 A healthy chocolate cake…how awesome is that! I love that frosting. I was craving a chocolate cake the other day and used coconut sugar and coconut flour. How did it work out Heidi. Coconut sugar is fab, but I find coconut flour on it’s own makes for a very heavy cake. I’m so impressed with this cake and that you made it in the air fryer. I’m super excited to try this myself and I love the banana cashew combination. Thanks Janice. Making cakes in it wasn’t what I originally had in mind, but it worked well. Have you tried yours out yet? Yes, I’ve made a couple of things, it’s really easy to use. 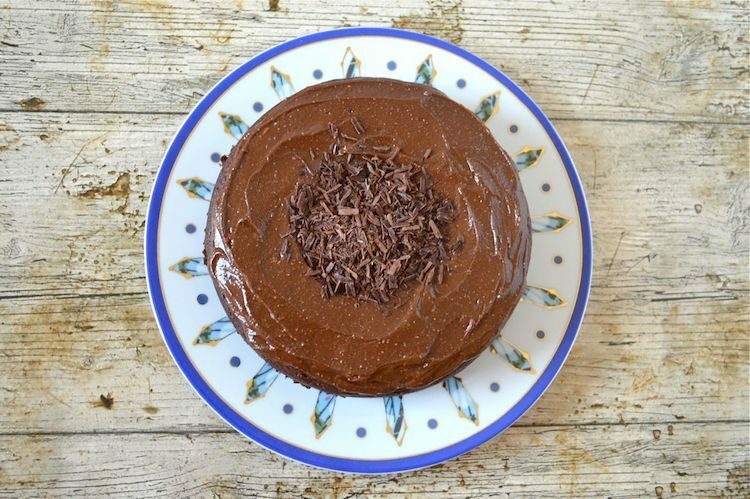 Oh my, Choclette… this may be my favourite of your vegan recipes! I am definitely making this! I love how the banana is cooked down with the fats and sugar, I bet it smells divine! Glad you are having fun with your new toy!! Thanks Poppy. Cake making in the air fryer wasn’t quite what I had in mind when I first heard of it, but it works well. Thanks Kate. The beauty about making a cake in the air-fryer is not having to turn the oven on for only a small item. I used to buy rapadura from our local organic shop, but that sadly closed down. I now stock up whenever I happen to be passing a good health food shop. Oh wow a healthy chocolate cake! Love that you can also bake in the HealthyFry. I wasn’t expecting the Healthy Fry to come with a cake tin. It just had to be tried. I know it says it can bake cakes, but I am still amazed! Wow Choclette! That looks and sounds amazing. Very impressed. Pinned, stumbled, tweeted and flipped. Thanks Jac. It’s not quite what I thought I’d be doing with the air fryer, but it’s great that it’s so versatile. Looking forward to experimenting some more. This cake with the chocolate cashew icing sounds heavenly. It really is Mina and made even better by including lots of nutritious foods. Amazing that you can bake a cake in the fryer – love this idea, am definitely going to attempt some vegan recipes this year! I had no idea you could make cakes in an airfryer – I thought they were mostly used for making chips! Oh Choclette – your cakes always look so delicious… and tempting! Cashew icing means healthy, right? Oh wow! This looks totally delicious and is right up my street. I think I might have to try it with my wholegrain gluten free flour blend…I think it would work a treat! Oh yes, I can see it working really well with your flour Vicki. Let me know how you get on. This looks absolutely delicious. Its incredible that you can make so much in the HealthyFry. Its brilliant! Yes, I’m super impressed with it Ciara. Only trouble is I can’t stop eating chips! I just want to dive in face first! !